Dressed poorly for the inclement weather (as is the norm), I dropped into Snapdragon Bakery to buck the chill with hot coffee, fresh pastry, and a fireside chat with some unsuspecting, non-morning person. Truth be told, I also had an ulterior motive. I could have dispensed with the caffeine, calories and camaraderie, and still been warmed by the whimsy, beauty and imagination manifested in the cafe’s December gallery show, Fable. I kept waiting for this snow leopard to join in our conversation. 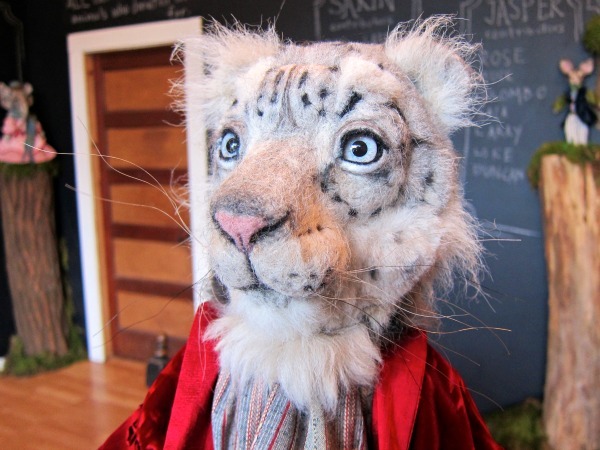 Initially, I raised an eyebrow when I heard the show centered around felted animals. My lesser self, wrongly imagined rows of wooly forms of beanie babies or tableaus of beds buckling under the weight of pastel, stuffed animals. When I heard felting, I saw dryer lint. (Bad Tom, bad.) 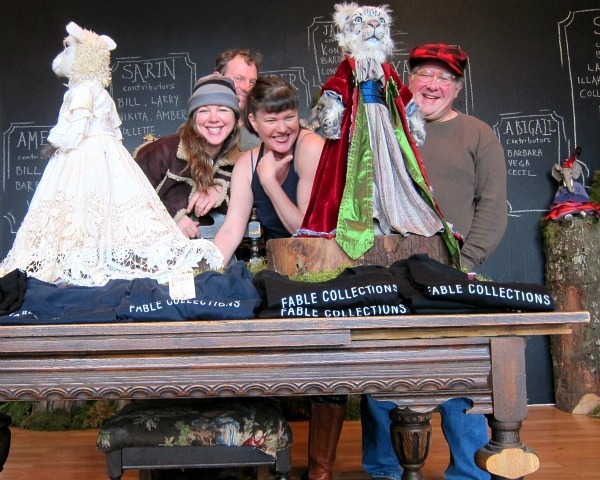 What I witnessed instead was a cast of fantastic, soulful characters perched on old mossy split logs, ready to share their stories, or in this case their fables —each one brought to life by gifted hands and fanciful fiber. 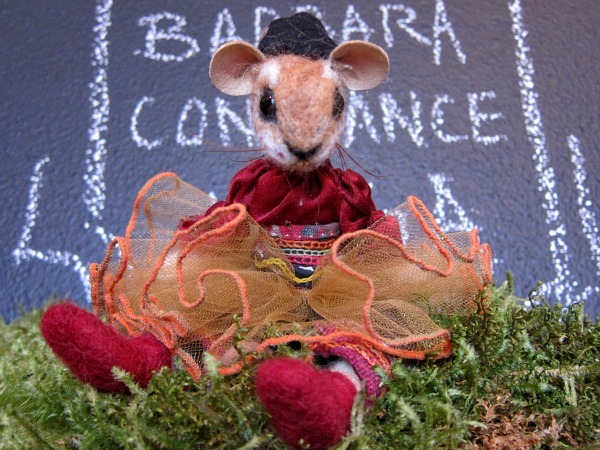 I think this mouse is friends with Betsey Johnson. 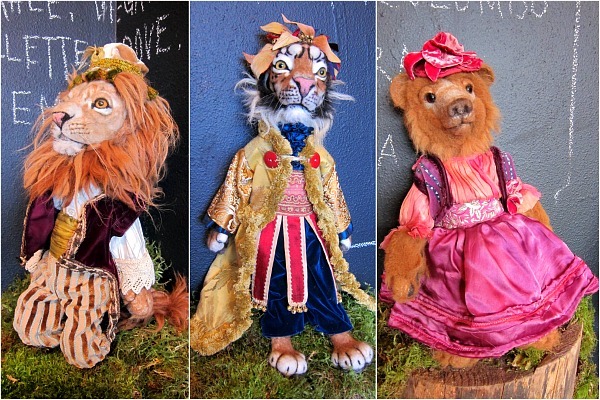 Artist Monica Gripman surprised and delighted us all with her detailed and dandy creatures, sporting fashions reserved for royalty, Edwardians, sultans, ballerinas, and a pirate or two. When Monica told me her artful journey began when she picked up a felting kit at the island pharmacy, my mouth pretty much dropped. 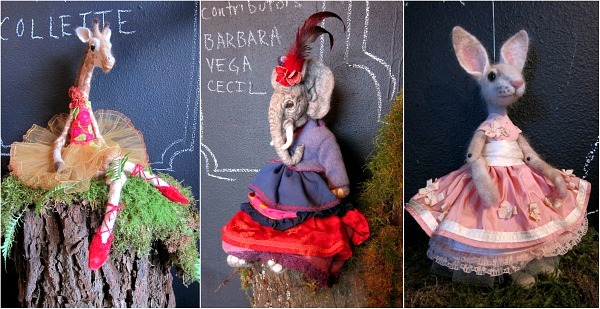 Her lush creations belie any hobby-kit heritage, for each character seems fashioned to tease our imagination and put our own wardrobe to shame. Critter couture never looked so good. The show is up through the end of December; should you need a good dose of delight, I recommend you drop by to spin your own tales with these lovely creatures, and also warm up a bit with coffee, croissants and conversation. Yes Tom…so glad your reported on this! People were all abuzz about it on Saturday after the very crowded First Friday opening. I must go back when there are not so many people there. I was not only blown away by the needle-felting, but the costumes were mind-blowing–such attention to detail. I kept expecting one of them to sit down and talk with me. 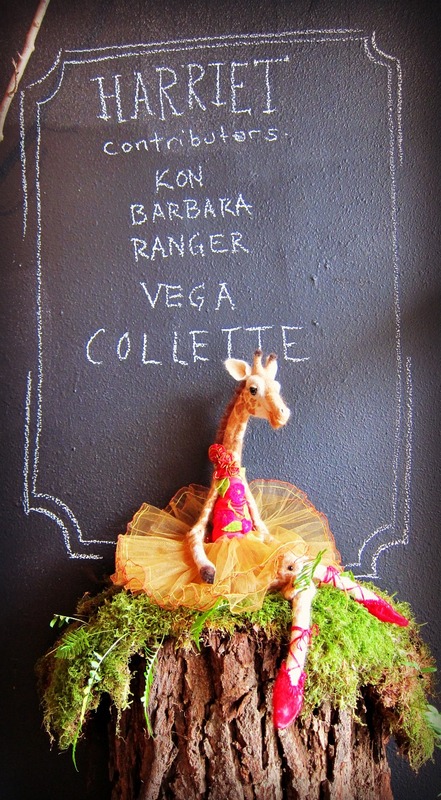 I found out that the “contributors” on the chalk boards were names of the sheep! Very cleverly exhibited. Congrats to Monica and all her helpers!!! Oh Cathy, I love that bit of info, that the sheep got some credit, too! Oh my-those are incredible. Love the detail. I want a pirate-LOL! Glad you posed by them-one would have no idea how large they are otherwise. I thought they were small at first. Very very nice! wow, these are very cool! 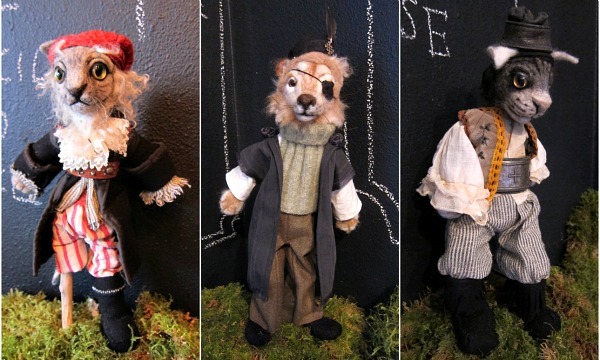 Mostly I dislike dolls, especially handmade ones. It’s not the dryer lint syndrome, it’s that they seem creepy to me. But these are spectacular. Thanks for sharing. I definitely want the pirate trio. I am entirely smitten and enchanted. These are works of art. Thank you so much for picturing them here.